The glitter, the flares, the boots, the hair, the costumes, the accents, the legs, the lights….. the songs?! Known simply as the “original and the best” -Abbasalutely are now the longest running and most successful ABBA show in the country. They continue to delight thousands at corporate and weddings every week, all year round. 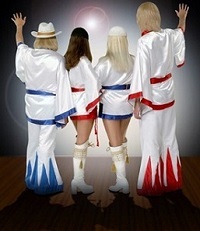 Enjoy this ABBA phenomenon with superb vocals, wonderful costumes, brilliant choreography and an amazing laser and lighting show. To book Abbasalutely or to talk to us about your event requirements, either submit the enquiry form, email:info@carolandassociates.com or call us on 087 718 1360.